Sen. Mark Udall, a Colorado Democrat, arrives at the Capitol in Washington, D.C., for a vote April 29. The political media (including FiveThirtyEight) tend to focus on the horse race. But who’s ahead right now matters, because someone will eventually take office and vote on legislation — nudging the overall ideology of the U.S. Senate this way or that. Of course, some races have the potential to nudge the chamber more than others. In the 10 most-competitive Senate elections in 2014, there are wide disparities in the ideological gaps between candidates. Some races feature candidates just to the left and right of center, while others pit two candidates from the opposing ideological poles against each other. To quantify these differences, I looked at three ideological rating systems. Second, I used Stanford political science professor Adam Bonica’s campaign contribution scores, which judge a candidate’s ideology based on the ideology of his donors. I converted these scores to DW-Nominate’s scale using the method previously described by Bonica and DW-Nominate’s co-creator, New York University political science professor Howard Rosenthal. Third, I put scores from OnTheIssues.org on the DW-Nominate scale. OnTheIssues.org categorizes candidates’ public statements and voting records as liberal or conservative. I only counted the issues on which a candidate has made a statement. I then averaged all these scores so that a -100 score was the most liberal, and +100 was the most conservative. This method isn’t perfect; in some cases, the scoring systems differ significantly. But averaging the three gives a consensus view. Per our numbers, the biggest ideological gap between candidates is in Colorado. Democrat Mark Udall is rated as the most liberal of the candidates running in a competitive Senate race this year. He is strongly pro-choice (he gets a 100 percent rating on abortion rights from NARAL Pro-Choice America), and he earned a 96 percent rating from the NAACP on minority issues, a 97 percent rating on the environment by the League of Conservation Voters and a 0 percent score from the National Rifle Association. Udall’s opponent, Republican Cory Gardner, is the fourth most conservative candidate running in these 10 races. He is strongly anti-abortion (he got a 0 percent rating from NARAL). He has only a 26 percent rating from the NAACP; he’s earned a 9 percent rating from the League of Conservation Voters and a 92 percent score from the NRA. Udall and Gardner’s large gap matches what we’re seeing in the Colorado legislature. The state has the second most polarized legislature in the nation, according to the University of Chicago’s Boris Shor. Iowa is right behind Colorado. Republican Joni Ernst is in the ideological middle of the GOP candidates this year, and she united all factions of her party in the primary. But Bruce Braley is among the most liberal Democrats vying for a competitive Senate seat. He fits the ideological mold of the senator he’s looking to replace, Tom Harkin. Compare Colorado and Iowa with New Hampshire, which features the smallest ideological gap between candidates. Democrat Jeanne Shaheen is 15 points more moderate than Udall, according to our numbers. Although she has earned a 100 percent score from NARAL and a 100 percent score from the NAACP, she also voted to extend the Patriot Act and ensured, as governor, that the death penalty remained legal in New Hampshire. The small gap between the candidates in New Hampshire, though, has mostly to do with the Republican candidate, Scott Brown, the former U.S. senator from Massachusetts. Brown built a relatively moderate record in the Senate, and he’s the least conservative Republican in these 10 races. Brown considers himself pro-choice (with limits), and his NARAL scores have bounced between 0 and 50 percent. He earned a 38 percent rating from the NAACP. Like Shaheen, he voted to extend the Patriot Act, and he wanted to legalize the death penalty in Massachusetts as a state senator. Arkansas Republican Tom Cotton, meanwhile, is on the opposite end of the spectrum. Cotton is 35 points more conservative than Brown, and he is the most conservative candidate in these races. That’s not surprising: Cotton is running in the most Republican-leaning state on the presidential level of any competitive Senate race. He earned a 0 percent score from NARAL, a meager 29 percent rating from the NAACP, a 7 percent rating from the League of Conservation Voters, and a 92 percent score from the NRA. As you would expect, the most moderate Democrat is also from a deeply red state. Kentucky’s Alison Lundergan Grimes is 26 points more moderate than Udall. She is pro-choice and wants to keep Obamacare, but she is also strongly pro-gun rights and pro-coal. These stances reflect the traditions of an Appalachian state. 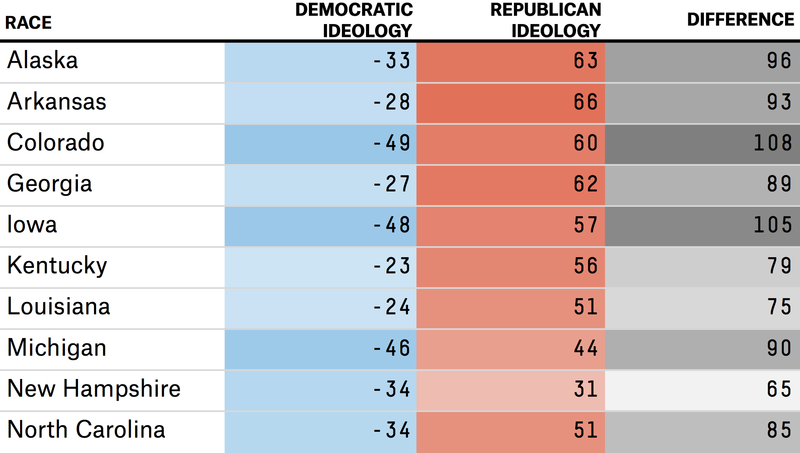 Party affiliation predicts ideology better than at any point in recent memory (there are fewer conservative Democrats and liberal Republicans). But there are still substantial intra-party differences. Ideologically, the stakes are much higher in Colorado and Iowa than in New Hampshire.